Aleiodes similis, copyright Graham Calow. 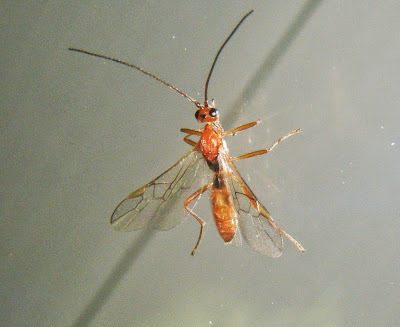 The Rogadinae are a group of braconid wasps that are endoparasites of Lepidoptera larvae, leaving the host mummified. Members of the tribe Yeliconini have tarsi with the telotarsus greatly enlarged with the preceding segments shortened, and the tarsal claws coarsely pectinate (Achterberg 1993). Characters (from Achterberg 1993): Inner side of eyes often distinctly emarginate; prepectal carina often present; median carina of propodeum usually at least half as long as propodeum; dorsal carinae of first metasomal tergite meeting each other and pointed posteriad; second metasomal tergite frequently with small triangular area medio-basally, tergite may be granulate; second metasomal spiracle often in notum of tergite. Last updated: 4 September 2017.